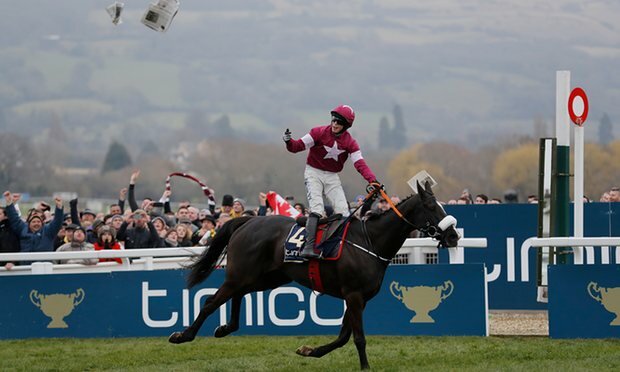 After the Cheltenham Festival 2016 our team of horse racing tipsters replayed all races over the four days and bookmarked the horses that were unlucky losers or maybe could've finished closer if given a better ride. Below you can see the horses that we have taken out of their race to follow in the near future or at the Cheltenham Festival 2017. Bet365 were non runner no bet and best odds guaranteed on all Cheltenham Festival races, why bet anywhere else? Fine performance behind Altior who could be something special. Made a mistake at the third hurdle when he took off way too early. Probably wouldn't have beat Altior even with a perfect round of jumping but that's no embarrassment at all. Wouldn't have beat the brilliant Douvan but definitely would've finished closer but for a couple of jumping errors (2nd fence and 6th fence). Was travelling really well just before the final bend and was jumping into third place at the 2nd last when was badly hampered by Vaniteux who unseated his rider. Probably would've finished in second place but definitely would've been closer to Douvan. Rich Ricci said after the race that Douvan was "The best we've ever had!". Fantastic performance behind Annie Power in the Champion Hurdle after almost two years off the racecourse. Nicky Henderson's horse were flying at the time but My Tent Or Yours clearly retains plenty of ability. Very lightly raced for her age and ran a huge race behind Vroom Vroom Mag in the OLGB Mares' Hurdle. Completely fluffed the final hurdle but stayed on really well up the hill to finish third, only three lengths behind the winner. Was around ten lengths behind the leaders just after the 3rd last fence before swinging into the home straight. Was staying on really well and was about to jump into fourth place at the 2nd last when the horse fell. Definitely saw out the marathon trip well and would've definitely grabbed at least a place. I'm sure that Barry Geraghty was absolutely certain that he was on the best horse in the race so he adopted a wide route throughout whilst Yorkhill was hugging the inside rail. Around the bend before the third last hurdle there was some jostling for position and Yanworth lost out. Yanworth then blundered at that hurdle which cost him a length or two. Yorkhill got the perfect gap on the inside after the final bend and secured first run on Yanworth as Alan King's horse was caught four or five horses wide. That won Yorkhill the race for me. Yanworth also would've preferred a stronger pace. Avant Tout was in 17th position swinging around the final bend in the Coral Cup but stayed on really well into 9th. Probably would've finished even closer had he jumped the last hurdle a little better. Expect this horse to step up in trip from 2m 5f, Avant Tout has won over 3m in Ireland. Taking absolutely nothing away from Spinter Sacre because it was a wonderful performance to win the Queen Mother Champion Chase again. I've watched the replay numerous times and the early pace was unbelievable. I believe that the way the race was run it suited Sprinter Sacre down to the ground where Un De Sceaux was just taken off his feet. I think we'll see Un De Sceaux show his true form when he is able to dictate the pace himself on soft/heavy ground.